I did not see hands deformed like this very often in the U.S. Here I see them every week. 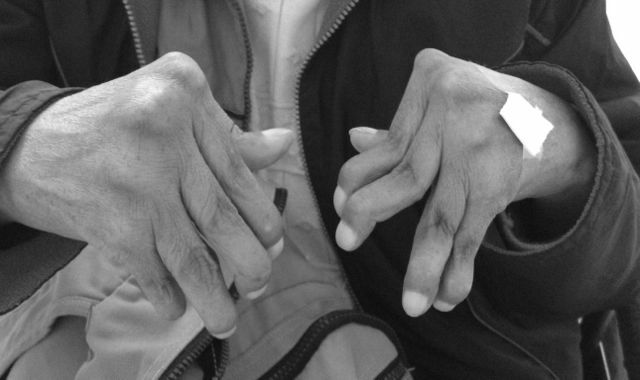 The changes are a consequence of rheumatoid arthritis. Rheumatoid arthritis has gone from being something I felt a little unsure treating, to something I treat without even glancing at a book. Most of the time people get better with simple medications, but there are unresponsive cases, and I often wish I had better access to some of the treatments available in the states. But I am so glad and thankful that we can help so many with what we have. This entry was posted in Diospi Suyana Hospital, Medicine and tagged Rheumatoid Arthritis by cairesonmission. Bookmark the permalink. interesting as I have friends here who live with this- so different. my heart goes out to those there who have to suffer with this and grateful that you are able to give maybe some relief!